Wireless networks have become so common place that most people take them for granted. However, when things go wrong, it can be very frustrating if you don't know where to start. +This is how you may get your Internet connection. -This is not the same as what a router provides. Fixed Wireless ISP: If you live in a rural area, you quite possibly have an ISP who provides you with Internet connectivity through a radio, also called a transceiver. The ISP will have radio equipment located on towers in various locations throughout their coverage area. Each subscriber will then have a client radio, that is specifically tuned to receive the ISP's signal. These client radios are mounted externally, usually on the the top of a client-side tower, like old TV antennas used to use. From that equipment, a cable will run into the building and connect to a high-speed modem. This technology is called Fixed Wireless because you can only receive the Internet connection from the specific location at which it was installed. The service is Wireless in that the connection to and from the client's location is provided through a radio signal, rather than a phone line or similar physical connection. This does not mean that they can walk around the property with a laptop and stay connected to the Internet. That is a different technology altogether and requires different equipment. Fixed Wireless radios typically operate on 900MHz, 2.4GHz and 3.5GHz spectrums. That's important to understand, because if you have equipment that uses the same signal spectrum, it might interfere with your connection. Older cordless phones, baby monitors, security cameras and other Wireless devices used the 900MHz spectrum. Modern Wireless routers and devices frequently use the 2.4GHz spectrum, making the possibility for interference with those technologies quite common. The 3.5GHz spectrum however, is typically licensed. This means that only approved equipment and carriers can utilize that radio frequency. This minimizes the chances of Wireless interference, but certainly doesn't eliminate it. The challenge with these systems is that they are a line of sight technology, which is why you have to have a radio mounted high in the air, outside of the location. The radio has to have a physical line of sight to the tower providing it with signal. Tree growth will be a challenge with these types of systems, because they will overtake the radio's line of sight and additional height often has to be added until the trees that are in the way reach maturity. WiMax: This is a bit more advanced and is not as reliant on line of sight. The ISP will still maintain a transceiver on a tower which provides the signal. WiMax is capable of faster speeds, but its range is a fraction of what you can get with the line of sight technologies. However, with the right equipment, including devices as small as a USB stick, or even integrated into certain components, you could actually get Internet connectivity throughout the entire coverage area. This is useful in small urban areas. If the ISP has enough radios located in enough locations, WiMax could blanket an entire city with Wireless connectivity. Typically, WiMax runs on the 3.6GHz spectrum. 3G/4G: The big boys entered the market with cellular technology. With these services, you can connect to the Internet in very wide coverage areas, basically anywhere you can get cell phone service. It can be lightning fast, however the distance from the cell towers dramatically impacts the speeds. So, advertised speeds will often be many times faster than what you will actually receive. Bandwidth is also a concern as many providers are still providing minuscule plans, a fraction of what you can get through traditional ISP connections and the overage fees can be exorbitant. In 2011, a typical ISP will offer a 60GB plan and overages will cost you around $1-2/GB. However, some 3G carriers will only offer you 5GB plans and charge you $0.05/MB for overages. That's equivalent to $50/GB. As ridiculous as that sounds, there are other carriers, in the United States for example, that are already offering unlimited bandwidth on their cellular data plans. So, there is some incredible disparity here that needs to be eliminated. +This is what you actually know. -This is what home routers provide. Wireless A (802.11a) - 5GHz - 20Mbps (effectively): When this standard was first introduced routers were still priced out of the reach of home users. It's rarely used and has a short range. The benefits of A are that it utilizes the nearly emtpy 5GHz spectrum. Wireless B (802.11b) - 2.4GHz - 11Mbps: Most early home routers utilized the this standard. In fact, because they use the same frequency range, most G routers will also support B. However, the speed of the B range is still quite slow at 11Mbps. Of course, as bandwidth demands increase as does Internet usage, this standard is quickly become too slow to be useful. B routers also have a short range, but it's certainly comparable to the A standard. Wireless G (802.11g) - 2.4GHz - 54Mbps: By 2003, home networking was really beginning to take hold and home routers had now become quite affordable. It is currently 2011 and for the past 8 years, G routers have become common place. Nearly every household that utilizes Internet will also have a G router. Even 2 years after the N standard has been ratified and 3 years after it was first introduced, you can still readily purchase G routers and every Wireless device being manufactured still supports the G standard. With speeds as high as 54Mbps, home networking has become very fast and complex. The data rates of this Wireless standard are such that they can carry large amounts of traffic very easily. The use of gaming consoles and video streaming on a G router is extremely feasible and widespread. Also, because it uses the same spectrum as the B standard, G routers have an effective range identical to that of their predecessors, which in theory is 125' inside a building, but over 450' in an open field. Of course, that's just theory and in practice it's actually significantly less. Wireless N (802.11n) - 2.4GHz/5GHz - 108Mbps: As of the writing of this article, Wireless N is the latest standard. N routers are widespread and just as easy to purchase as G routers. All new devices support both G and N standards. With speeds as high as 108Mbps, Wireless N Routers have become very useful to home theater enthusiasts, because up until now, it was not possible to stream high definition videos across a Wireless network. Now that it is, many entertainment components such as hi-def television sets, A/V receivers and Blu-ray players support Wireless N technology. Some of them even have Wireless N cards built right into their systems. Wireless N is the only standard that utilizes both the 2.4GHz and 5GHz spectrums. The N standard took quite a significant amount of time to ratify and every manufacturer was releasing routers they claimed were N compliant, before the standard even officially existed. I'm sure that didn't help the process any. The biggest difference within the operation of the N standard is that it supports MIMO, which means multiple-input, multiple-output antennas. This means that N routers can use multiple signal ranges at the same time. It's a very odd direction for the standard to take, since all previous incarnations maintained only a single spectrum range. The last major benefit of the N standard is that its effective range is significantly larger than that of the G spectrum. In theory, an N router has an indoor range of over 200' and an outdoor range of over 800'. To be honest, I have yet to see evidence of N routers reaching any further. However, most people are interested in the N router for its speed more so than its range. What does all of this mean for you? Well, if you are looking for a home router, a G router is very affordable and practical for everything from home networking to Wireless gaming and sharing Internet connections. However, if you want a longer effective range and the ability now or in the future to be able to stream high definition videos, then go with an N router. They cost a little more, but they can also do a lot more, because of the higher speeds they are capable of maintaining. Now that you know the difference between your in-house Wireless connection and a Wireless ISP connection, you can narrow down connectivity issues. Your connection to your router does not have any bearing on whether or not your actual Internet connection is working. Either connection can be working or disconnected, regardless of the status of the other. Use The Windows Wireless Utility to find the network to which you want to connect. If Windows cannot see any Wireless networks available, then Ensure Your Wireless Radio Is Turned On. 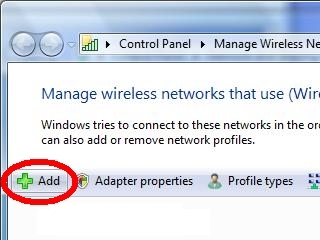 If Windows indicates that it is not configured to manage your wireless networks, you will need to Disable 3rd Party Wireless Utilities and then Enable The Windows Wireless Utility. 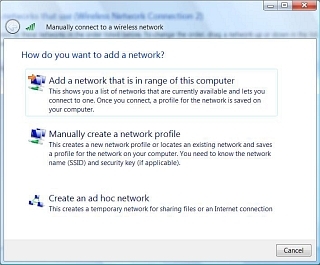 If you try to connect to a network you have previously been able to use, but it no longer works for you, then Remove The Old Wireless Profile and recreate the connection. If you are having problems with the signal being too low then read the section on Signal Strength in order to understand what that means. If you can connect, but the signal is unstable, then try changing the Wireless Channels and also read the section on Wireless Interference in order to determine if there is anything you can change within your environment in order to eliminate the issue. -This is how you do it. First, let's open the Control Panel. You'll either click Start and then Control Panel, or you'll need to click Start, Settings and then Control Panel. Once that opens, if you're in Category View, you will need to click Network and Internet Connections. 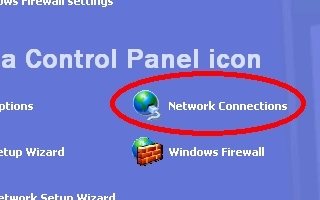 Either way, you will now want to click Network Connections. Locate your Wireless Network Connection, right-click it and select View Available Wireless Networks. Locate your network from the list, select it and press Connect. If you don't see your network in the list, press the Refresh network list link in the left-hand column. 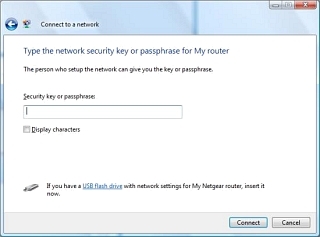 When asked for the Network Key enter the Wireless Password for your network, that you already created in your router. Retype the Password in the confirmation field and press Connect. 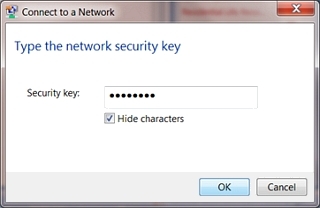 Providing you didn't misspell the Password, you are now connected to the network. Otherwise, you'll have to retype the Password, correctly. You can then close the Wireless Network Connection window. If your router is already online, test your connection. Once that opens, if you're in Category View, you will need to click Network and Internet. Either way, you will now want to click Network and Sharing Center. 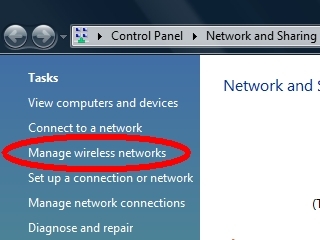 On the left hand side, you're looking for the link that says Manage wireless networks. Press the Add button in the toolbar. Select Add a network in range of this computer. Locate your network, select it and press Connect. If you don't see your network in the list, press the Refresh button in the top right corner. It looks like two arrows pointing at each other. 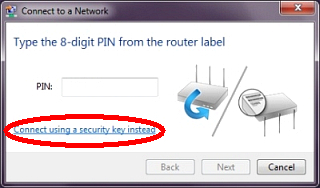 When asked for the Security Key enter the Wireless Password for your network, that you already created in your router. To make the job a bit easier, you can put a checkmark in Display characters, so that you can see what you're typing. Once you're done, you will see the successful connection window. Leave both checkboxes checked and press Close. You will be asked to Select a location for the Network. Most likely you should select Home. 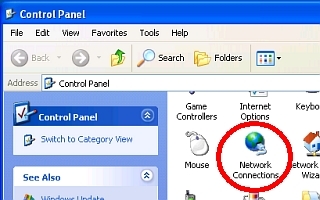 Locate the Network Connections icon from the system tray, in the bottom, right hand corner of the screen, by the clock. It looks like the a monitor with a pitchfork in front of it. I believe that is supposed to be a plug. Click on the icon. Select your network from the list that appears. Leave the checkmark in Connect automatically and press Connect. If you are asked for a PIN, click Connect using a security key instead. When asked for the Security Key enter the Wireless Password for your network, that you already created in your router and press OK.
+It's playing ''Swinin' with the Oldies''. -That's your FM radio. I'm talking about the Wireless Radio on your computer. First of all, if you're using a notebook computer, make sure that the Wireless Card is turned on. I also found this useful guide, detailing How To Toggle Wireless Cards On Various Notebooks. 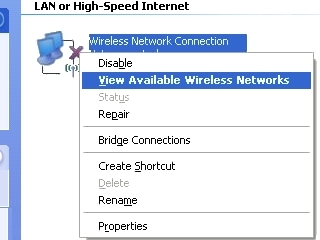 If you can't find any Wireless networks available when using the Windows Wireless Utility and you are sure the router is properly configured, then there are two other possibilities. The first is that the utility is turned off, because another application is managing your Wireless networks, in which case you would need to Disable 3rd Party Wireless Utilities. The second option is that your Wireless Radio is turned off on the computer. Above the keyboard, there are often a series of buttons which may have light indicators on them. If the Wireless Radio is controlled by one of these, there is usually a symbol that will look like an antenna or satellite dish. Along the left or right of the keyboard, on the top of the notebook, there might be buttons, similar to the ones I just described. Along the leading edge of the computer that is facing you, or possibly along either side of the computer, there might be switches. These come in many forms. They can be spring-loaded switches, physical sliders, or even a button. If your Wireless Switch is in one of these locations, it will usually have an LED that will illuminate when the Radio is On. Finally, there are the items marked in blue. Many computers utilize a key-combination for accessing multiple features, such as changing monitor outputs, volume control and of course, toggling the Wireless Radio. The way that this works is that you press and hold the FN key in the bottom left corner of the keyboard and simultaneously press the appropriate Function key. At the top of the keyboard are the Function keys labeled F1 through F10. Examine the blue symbols that accompany these keys and you will likely see one that has a symbol that resembles a satellite dish or antenna. That is the key you would press in order to toggle the Wireless Radio. If your computer has the FN key combination available it may also have a switch located in one of the other places. Generally, the FN key combination only toggles the software for the Radio, but there will often be a physical toggle, as well. Once you've ensured the Radio is turned back on, wait about 30 seconds. Then, Refresh the Wireless Utility, so that it will scan for new signals available in the area. It should now see the router to which you are attempting to connect. If not, then ensure the Windows Wireless Service is enabled and that no 3rd Party Utility is attempting to manage the connection, instead. +The wheel has already been invented. -I doubt we can build a better one. This has always annoyed me. Almost every Wireless card manufacturer feels the need to release their own Wireless connection utility. It's as if they feel the need to reinvent the wheel. I have yet to see a Wireless utility that works better or offers any benefit over the one built into Windows. So, why bother? For one thing, it's just another application, which nobody else knows how to use. Technical support agents will stumble around inside the utilities, looking for the screens equivalent to what they're used to using. Instead of messing around with them, we're going to turn them off, so that you can use the Windows Wireless Utility to connect. In the Wireless section of Emulators troubleshooting I have links to view a number of Wireless utilities. You can also find a couple Wireless utility guides on Chasms.com, under the Networking section. 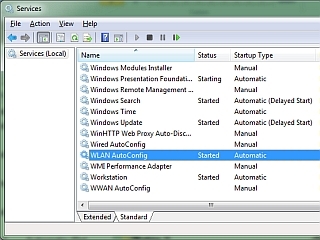 Locate the Wireless utility running in the system tray of your computer. That's the part of the screen in the bottom, right corner, by the clock. Press the arrow to expand the system tray, if you need to see all the icons. Look for an icon that usually resembles a set of stairs, or signal bars. On your system the icon may look something else, but that's okay, because as you roll over each one, Windows will tell you what they are. You are looking for something called a Wireless Utility, or Wireless Connection Manager. Once you have found the utility, you can do one of two things. You can either right-click the icon or double-left click the icon. Double-left click will often open the connection utility, whereas right-clicking the icon may give you a menu with several options. 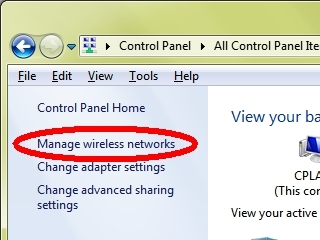 If you see an option to Let Windows manage my wireless network, Exit or Close the wireless utility, then choose that. Basically, we just want to tell the program to shut down and not try to manage the Wireless networks anymore. If you don't see a menu item that let's you shut it down, then choose the option to open the utility, instead. If you had to open the utility, then we'll need to dig around inside it for an equivalent option. On many utilities, you would click on the Wireless tab, uncheck an option labeled Let this tool manage your wireless networks and Apply the changes. 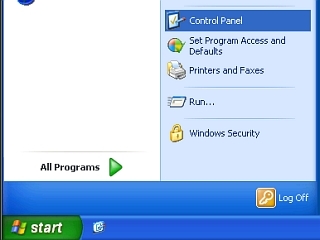 In other programs, you might see an Advanced option or a drop-down box that has the utility run on system startup. Disable that feature, if you see it. Sorry, I can't be more specific. There are so many possibilities of what this could look like or how it functions, that it's hard to narrow it down. You will need to use some intuition in order to determine which option you choose. Once you have managed to shut down the utility though, you probably need to turn the Windows Wireless Utility back on, so proceed to that section. +Turn the service back on. -This was probably disabled by a 3rd party utility. When a third party utility tries to manage the Wireless networks for you, they usually turn off the Windows Wireless Utility. In order to turn that back on, we need to open the Services console. In the window that opens, type Services.msc and press OK. If you can't find the Run… prompt then click Start, All Programs, Accessories and then Command Prompt. In the DOS window that opens type Services.msc and hit Enter. In the Search box above the Start button type Services.msc and hit Enter. The Services window will open and you're looking for WLAN AutoConfig. Once you've located the item in the list, double-click on the entry to open the Service window. Ensure the Startup type drop-down box is set to Automatic. 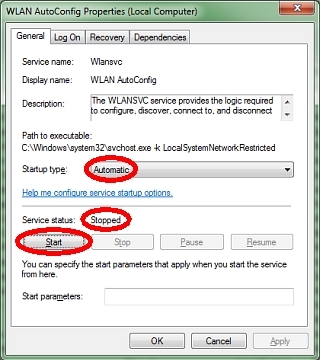 If the Service status indicates it's Stopped, then press the Start button in this window to reinitialize the service. Note: The Start button will only be available in this window if the Service is Stopped. Conversely, if the Service is already running, the Stop and Pause buttons will be available. However, if the Resume button is available, then the Service is already running, but it's Paused for some reason. In that case, just press the Resume button. Once the Service has restarted, close both windows. If you get an error starting the Wireless Service, do a Google search to find a resolution. I'm sorry, but that particular problem would fall outside the scope of this troubleshooting. If the Service restarted without a hitch, you should now be able to use the Windows Wireless Utility in order to connect. 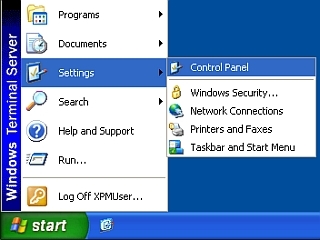 However, Windows XP has one more setting we need to check. You will also need to ensure that Windows will now manage the networks for you. So, open the Control Panel. You'll either click Start and then Control Panel, or you'll need to click Start, Settings and then Control Panel. 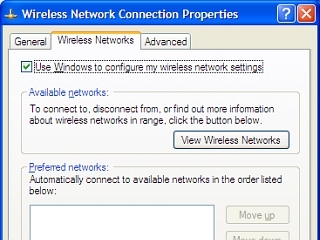 Locate your Wireless Network Connection, right-click it and select Properties. Click the Wireless Networks tab. 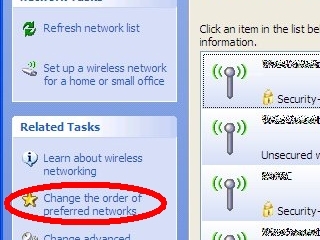 Ensure there is a checkmark in Use Windows to configure my wireless network settings and press OK.
You only have to do this with Windows XP, because later Operating Systems simplified the process by assuming that Windows would manage the Wireless Networks if the Service was turned on. You can now return to Using The Windows Wireless Utility. +Delete and recreate the profile. -Windows Wireless Network profiles often get corrupted. From the left column, select Change the order of preferred networks. 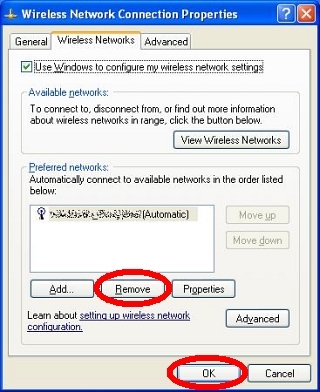 Find the profile of the Wireless Network in question, select it and click Remove. 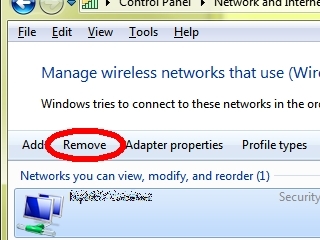 While you're in here, also remove any other Wireless profiles for networks to which you know that you will no longer connect. Press OK or your changes will not take effect. You can now search for your Wireless Network and recreate the connection. 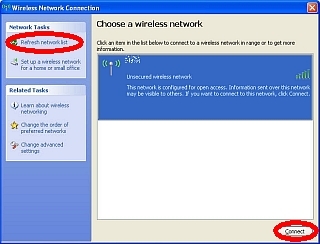 Find the profile of the Wireless Network in question and select it. This will cause the Remove button to appear in the toolbar above the profile(s). Click Remove and you're done. +My router can beat up your router. -Maybe, but it can't transmit further than my router can. 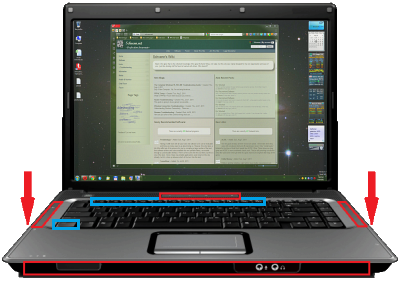 If you have a wireless connection on your computer, look for your signal strength indicator in the bottom, right corner of your screen, by the clock. Press the arrow to expand the system tray, if you need to see all the icons. Look for an icon that usually resembles a set of stairs, or signal bars. Typically, there will be five bars. If all five are lit up, then you have very strong signal strength and should have no trouble getting online. Three to four bars should be a steady signal, without issues. However, if you have only two bars, then you probably drop connection a lot and the signal is not very useful when it's this low. You should look at ways to improve your signal strength. 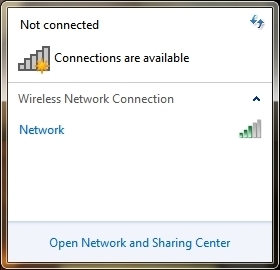 You will not get connected with only one bar. There are other signal indicators available. Some are simply verbal indicators such as Very Low, Low, Moderate, High and Excellent. Others use a signal percentage from 0-100%. Obviously, the same rules apply. You want Moderate signal or better, or you want well above 50% signal strength. If your signal indicator measures the signal in actual voltage, or dBm, then you want -75dBm or better. In other words, -50dBm is excellent, but -90dBm is poor and probably won't connect. +Can I get HBO on this thing? -Wrong type of channels, but actually, yes. Before you start, I recommend you read my article on WiFi Over-Population. It will give some insight into this particular chapter. In North America, there are 11 Channels available within the 2.4GHz spectrum. However, in Europe, there are 14. Each Channel utilizes a radio spectrum width of 20MHz. Some advanced routers will allow you to customize these Channels to be as slim as 10MHz or as wide as 40MHz. In North America Channels 1 through 11 utilize the spectrum from 2.412GHz to 2.462GHz. In Europe this goes all the way up to 2.484GHz. It would therefore, be advantageous for someone in North America to obtain drivers or firmware that allow them to use these higher channels, thereby avoiding interference from other routers. Note: I'm not sure if utilizing Channels 12-14 in North America is legal or not, but I can't see that it would cause a problem or that anyone would care. Every Channel overlaps with several of the Channels beside it. The only Channels that are far enough apart not to overlap with each other are 1, 6 and 11. In other words, Channel 1 overlaps with Channels 2-5 and the same is true for every subsequent Channel. Understanding this concept is key in troubleshooting, because if you're experiencing problems due to an adjacent router, then moving one or two Channels away will accomplish nothing. You will need to move at least five Channels away in order to avoid any routers in the same part of the radio spectrum. By default, routers will choose Channel 6. So, if you live in an area where there are several other Wireless routers in range, the best channels to use are likely 1 or 11. If those don't work, then you can try the intermediate Channels such as 3,4,8 or 9. If you have a router that has an Auto Channel Scan feature, the router will dynamically adjust whenever it determines there is interference. If that doesn't work well or you don't have that feature, then you will have to manually pick the cleanest Channel you can find, through the process of elimination. That's where programs like inSSIDer come in handy, because they let you visualize the radio signals, their strength due to proximity and the spectrum overlap, all in real-time. Let the software run for at least an hour before you do anything, so that it can capture enough data. At that point, you should be able to make an educated decision regarding what Channel(s) are the most advantageous to use. +Whenever I make popcorn, I lose my Internet connection. -I actually had a customer with that problem. Let's get this out of the way, immediately. If there are too many factors impacting your signal to the computer and you primarily use the computer as a stationary device, then running an Ethernet cable to your computer may be the best solution. A wired connection is of course, always more reliable and less complex to manage. Distance: The theoretical range of a router is usually based on an empty world concept. If you're standing in an open field, with no wind, no trees, perfect weather and you broadcast from a G router, you might be able to get 450'. Inside, you may be able to get a third of that. Realistically though, I've seen routers have problems reaching 50'. That's because distance combined with other factors that impact signal continually shrink the effective range. Typically, if a customer had a 2 storey home with a router located in their basement, they would not likely be able to reach the top floor with the wireless signal. Buidling Construction Every door, wall and floor your signal has to pass through in order to reach it's destination cuts the signal by about 3dB. If you have heavy construction such as heavy wooden doors and furniture, concrete floors, stone walls or lathe and plaster walls, that will have even more significant impact on the signal. The problem is that lowering a signal by even 3dB effectively cuts the power in half. So, if you have too many physical obstacles to pass through, then the connection will eventually be impossible to reconcile. Metal Building: In the early 1800's a scientist by the name of Michael Faraday constructed a cage, aptly called the Faraday Cage. Since your signal is essentially an electronic charge passing through the air, the metal shell of the building will cause the signal to reflect or redistribute it's charge across the surface, cancelling the signal's effectiveness on the other side. In other words, if you have a router inside or outside a metal structure, use an external antenna on the opposite side in order to ensure coverage on both sides of the building. Water: Water has very strange dynamics, both due to its density, as well as it's reflective properties. If your router has to pass through a large, 20 or 50 gallon fishtank for example, a large portion of the signal may be absorbed. Bodies of water like rivers, lakes and ponds can have even more dramatic effects on signals, effectively scrambling or scattering the signal. I could spend hours explaining how this happens, but from a laymen's standpoint just know that if you live close to a body of water and you're trying to pass a signal across it, you will likely have problems. Flourescents: There are many devices within a building that give off electronic noise, even if they are not tramitters by themselves. Flourescent lights are very noisy, in this regard. I'm not talking about the incadescent replacements that environmentalists are touting as a better alternative to the conventional light bulb. Those are not significant enough to have any impact. However, the large tube lighting with ballasts that you typically see in kitchens, offices and cafeterias, cause electrical interference across their entire surface area, which of course, can be fairly signficant. This will usually impact the signal if the lights are in the same room as the router or the computer, but not if they are in an adjacent room. Large & Unshielded Appliances: Newer televisions tend to be shielded, but older televisions, such as floor model, console TV's, can cause interference. Fridges, stoves, washers, dryers, freezers, large speakers, especially if they are unshielded, all have an impact. Again, these devices are usually a factor only when they are in the same room as either the router tranmitting the signal or the device receiving it. Microwaves: Did you know that microwaves and radio waves are very similar? The appliance you use to heat up those frozen dinners essentially uses radio signals to heat up your food. They have metal cases not because of heat distribution, but because of the Faraday cage concept that I mentioned earlier. The case is designed to keep microwaves from leaking out, which would pose significant health risks. However, even the newest, most expensive units will still let some signal escape and this can interfere with Wireless signals in close proximity. Definitely keep routers and computers in completely separate rooms from microwaves while they're operating. Using this office as an example, we had a router mounted to the ceiling in the back room and a microwave that is 30' away from it. Whenever the microwave was used, signal quality was significantly impacted for everyone connecting to that router. It used to be bad enough to kick most people off the Internet, but we installed a router with a stronger radio and it now only causes some packet loss and speed degradation. Other Wireless Devices: The common radio spectrum for devices such as cordless phones, baby monitors and security cameras are: 900Mhz, 2.4HGz, 5.8GHz and 6GHz. Wireless A and N routers use the 5GHz spectrum, so the devices in the 5.8GHz range may impact them. Wireless B, G and N routers use the the 2.4GHz spectrum, so devices in that range may impact them, as well. This is something to keep in mind when purchasing new devices for your home. If you already have these devices, you can usually find a sticker on the base or bottom of the component, which will indicate the frequency range on which they operate. Avoid conflicting signals as much as possible. Move cordless phones and their bases into rooms away from the routers and computers, or ensure they are on a spectrum well outside the frequency range of the router. Cobras: Snakes mess everyting up and if they're alien snakes, then you're really in trouble.